A post card from friends Helen and Fred in Caherdaniel, Ireland. 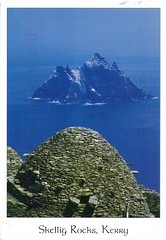 They live not far from the Skellig Rocks which are off the south west coast of Ireland in County Kerry. We visited this beautiful part of the world in the winter of 2004, and would very much like to return one day. Thanks for the great card, Helen and Fred!